This residence was designed in 1936 by the renowned architect Paul Revere Williams for investment banker, George Castera and his wife, Evelyn Dupee Castera, in the French Provincial style. Williams, who was the first African American architect to be elected as a fellow of the American Institute of Architects, was responsible for the designs of the homes of much of the area’s rich and famous, yet he also did work for many lesser heeled clients, as well. George Castera was to later establish the California Institute for Cancer Research, which as instrumental in fund-raising for cancer research and hospital construction. Their interest may have been due to their one child, George Walker Castera, who died in 1950 at the age of 19. Evelyn Castera died in 1960 and George married a neighbor, Edna McLean Van Wart the following year. Edna was an original founder of the Los Angeles Music Center and a long-time supporter of the Children’s Hospital. Together they established the Evelyn Castera Cancer Research Library at UCLA. Edgar Ward passed away on November 8, 2000, on the eve his 65th wedding anniversary. Jane (Wyatt) Ward passed away at home on October 20, 2006, at the age of 96. As one of the original homes in Bel Air, the Castera-Ward Residence is important as a pioneer home in one of Los Angeles’ best known and most influential communities. 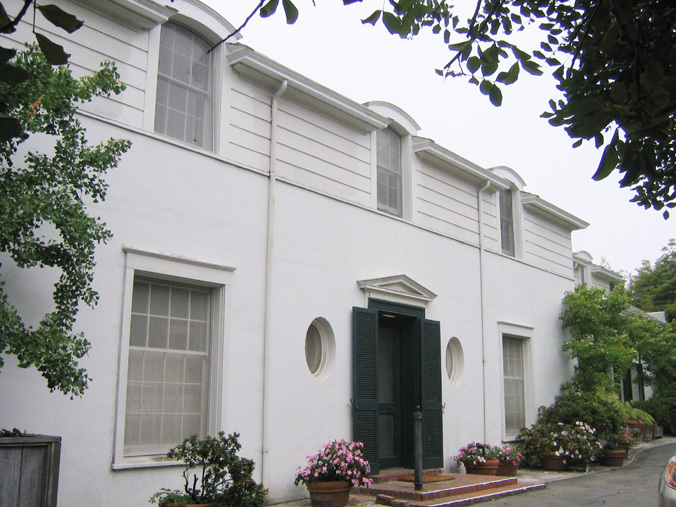 It is an important rare Southern California example of French Provincial architecture, designed by a master builder, Paul R. Williams. Both the Castera family’s contribution in the field of cancer research and Jane Wyatt’s legacy in stage, movies and television history show a continual association of the residence with the important people and events that have helped to shape and define world history.